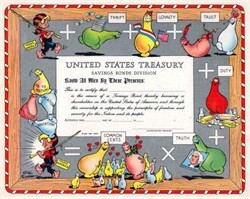 U.S. Treasury Bond Certificate in full color bordered with Al Capp cartoon characters, featuring the "Schmoo." Printed by GPO in 1949, used by War Finance Committee of U.S. Treasury Department as a promotional item to raise money after WWII through the sale of savings bonds. Contains Al Capp printed signature in lower left hand corner. Unissued in EF+ condition.